Back to normal this week with only a couple postings. Today I’m displaying one of the few officially licensed t-shirts to include Firestorm. 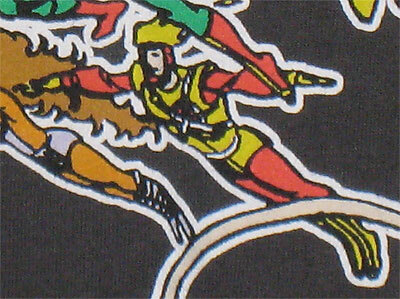 For the record, I don’t know of any official t-shirts that feature Firestorm all by himself. Today’s shirt came from Kohl’s in the summer of 2008. It’s a great late-Bronze Age shot of several DC heroes. The art is by Jose Luis Garcia-Lopez, the brilliant artist that did much of the DC promotional stock art in the 1980s. The shirt specifies the Justice League of America, and yet includes several non-League members; such as the Marvel family, Plastic Man, Batgirl, Supergirl, Robin, Wonder Girl, and Starfire. If you check out this same image on the Aquaman Shrine, you can see it was originally drawn as a DC Style Guide image under the header of “Super Heroes”. It appears the same image was repurposed for this t-shirt and then slapped with a JLA logo to sell better. As far as I’m concerned, who cares. I’ve got a t-shirt with Firestorm, Aquaman, and the Flash! I’m pretty happy with it! Oh yeah, having trouble finding Firestorm? Look beneath Captain Marvel, between Hawkman and Starfire. Here’s a close up. I’ll be posting other Firestorm-related apparel in the future. 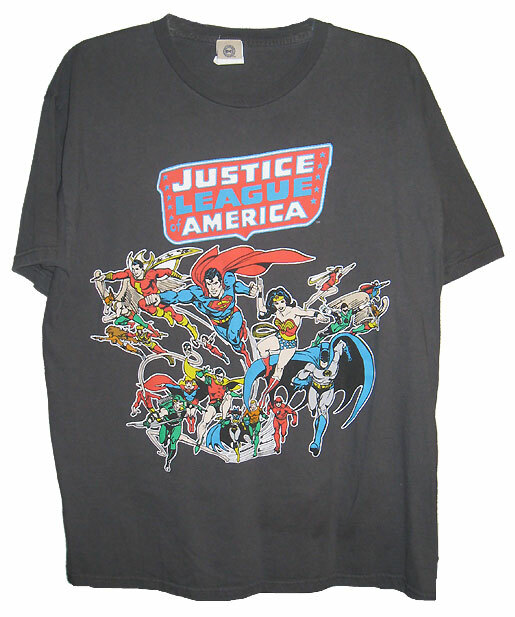 Posted in: Apparel, Justice League of America.